Romantic Hideaway. Medieval Hilltop Village-Tuscan Island, Beaches only 10mins. Lilliput is a delightful romantic hideaway; a self contained ground floor mini-apartment in the heart of the medieval hill-top village of Castello, on Giglio Island, Tuscany. Living inside the ancient village of Castello is a unique experience in itself. Castello is 500 metres above sea-level, offering incredible views across the Mediterranean to the islands of Montecristo, Elba and Corsica beyond. Four splendid sandy beaches are within 10 mins drive or bus ride. The islands' countryside is spectacular. The apartment has been carefully restored, retaining all original characteristics i.e. wooden rafters, beams and shutters, tile flooring etc. Lilliput, near the old village church, has its own entrance (see picture). It comprises living area with large sofabed, LED TV, fireplace and dining area, quality kitchen with dishwasher, oven, hob, fridge/freezer, separate small bedroom with king size bed. Bathroom with shower and washing machine. Embroidered, pure cotton sheets/towels supplied. Natural Beauty: Springtime on the island is a riot of colourful flowers with a permanent backdrop of blue skies and sea. Giglio (pronounced 'Jeeleeo') is well known for the natural beauty of its pinewoods, terraced hills, vineyards, bays, beaches and countryside. In the summer months one can hear impromptu jazz and folk music played in the streets and the village is alive with typical, bustling Italian colour. The people of the island are known for their genuine warmth . Surroundings: A trip to the mainland will bring you within driving distance (1 - 3hrs) of many fascinating places such as Rome, Pisa, Florence, Siena and the famous Sulphur swimming pools at the beauty, health spa of Saturnia, in the Tuscan countryside. Rome, with its magnificent sights and fashion shopping, is less than a 2 hour drive on the autostrada, from Porto Santo Stefano, on the Argentario promontory. Supply of hand finished quality bathroom towels provided. Giglio island has 4 good sandy beaches, approx.15 min drive from the village. Sunbeds, umbrellas, pedalloes, windsurfs and motor boats may be hired from June-September. Scuba diving is well catered for. Restaurants, pizzerias and cafe's are plentiful, either inside or out in the winding streets of Castello or along the waterfront of picturesque Giglio Porto. 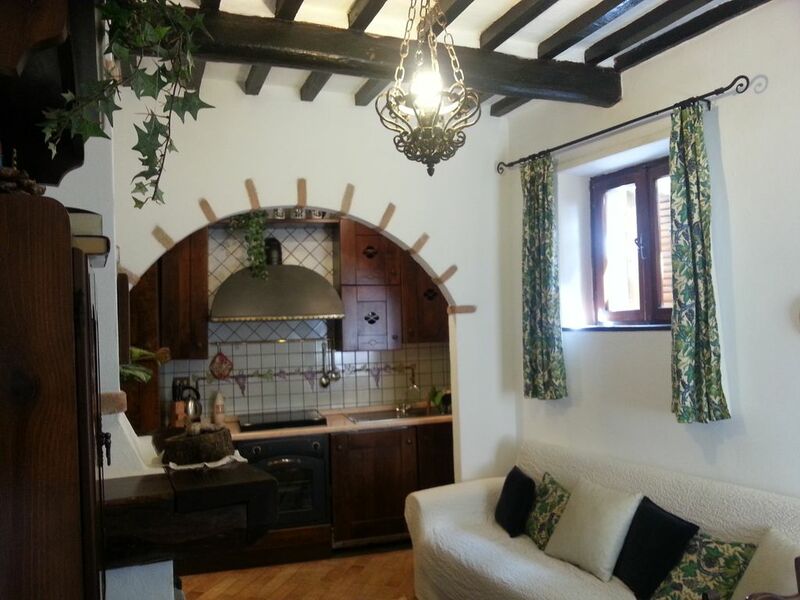 Or you can take advantage of the local wines, fresh fruit and veg and home made ice cream to prepare your own Italian meals in the comfort of Lilliput. The islands scenery is truly beautiful all year round. - MAJOR CREDIT CARDS ACCEPTED. Castello is a medieval fortified hilltop village surrounded by ancient walls, on the island of Giglio, (pronounced 'Jeelio') which is part of the Tuscan Archipelago, in the mediterranean sea. It is situated 11 miles from the coast of Tuscany (55 mins by ferry from Porto Santo Stefano). It is also a nature reserve. The whole of Castello is proudly conserved as a unique national monument. Other Activities: Nature trails, boat trips around the islands and basking in the sun.